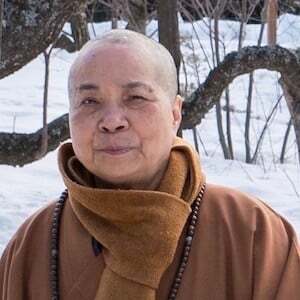 Venerable Bhikshuni Master Wuyin and a faculty of six nuns from her Luminary International Buddhist Society in Taiwan taught the Living Vinaya in the West course at Sravasti Abbey in 2018. Read her talk about the experience. Ven. Master Wuyin received her novice vow in 1957 and her bhikshuni vows in 1959. She is the leader of Luminary International Buddhist Society in Taiwan, which oversees study programs for nuns and laypeople, as well as translation and publishing projects. .
She sat at the feet of Elder Baisheng, Honorable Bhikshuni Tainyi, and Mingzong. After her ordination, she pondered deeply the question, “What role should a Buddhist monastic play in the modern world?” To answer this question, she entered Chinese Cultural University, and later pursued advanced studies in Hawaii. Through lots of learning experiences from different teachers, she realized that the key to helping bhikshunis (fully ordained Buddhist nuns) find a meaningful role in modern society was education. Thus in 1980, when she became the abbess of Luminary Temple in Chia-Yi, Taiwan, she set up the Luminary Buddhist Institute to give bhikshunis the opportunity to receive a well-rounded monastic education. Under her guidance, Luminary Buddhist Institute has become one of the most respected centers in Taiwan for education and training of bhikshunis. Ven. Wuyin realized that it was important not only for bhikshunis to receive a solid Buddhist education, but that it was also their duty to offer the lay community the chance to study Buddhism. Thus since 1984, she and her senior disciples established Dharma centers in cities throughout Taiwan, which provide Buddhist education to adult lay people. The classes do not follow the traditional method of exclusive lecture presentation, but include discussion and dialogue to enable the students to learn how to apply Buddhism in their daily lives. To broaden and deepen the understanding of Mahayana Buddhism, Ven. Wuyin has invited teachers from the Theravada tradition to give lectures and conduct meditation retreats, and instructed the Luminary Publishing Association to publish translations of works by eminent Theravadin teachers, such as Ajahn Buddhadasa and Bhikkhu Bodhi. In addition, she allowed her disciples to travel to Myanmar and Sri Lanka to meditate or to various other countries for advanced study in such as fields as Buddhism, Psychology, Education, and History. Ven. Master Wuyin is an expert in Buddhist Vinaya, both theoretically and experientially. She has taught bhikshuni precepts in Taiwan, India, Hong Kong, Malaysia and Myanmar, and now at Sravasti Abbey in the USA. Especially, in 1996 she taught bhikshuni precepts at Bodhgaya in India, in the course of “Life as a Western Nun,” co-organized by Abbey founder Ven. Thubten Chodron. Those teachings were later translated by Ven. Jendy, edited by Ven. Chodron, and published as Choosing Simplicity, The teachings open up the hope for Western Tibetan nuns and Southeast Asia nuns to establish bhikshuni sangha. As a bhikshuni, Master Wuyin has tried throughout her life to improve the status of bhikshunis. She has created an educational institute and structure that has given birth to several generations of well-educated nuns and laypeople. Her biography shows us how a modern woman, with roots in Buddhist tradition and a keen, open, and active mind, has tried to create a solid bridge connecting Buddhism to the modern world.